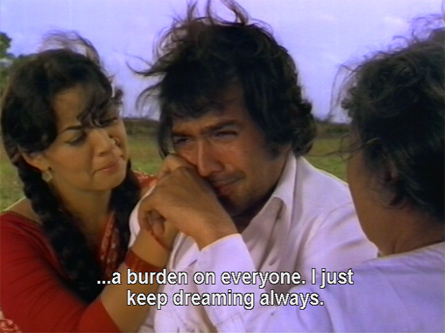 Our story opens at college, where an impoverished student named Raja (Rajesh Khanna) dreams of making it big and winning his true love Nisha (Neetu Singh look-a-like Sulakshana Pandit). His rival for her affections, Ranjit (Ranjeet) is the class bully and a cheat; but Ranjit’s father and Nisha’s father are close friends and want their children to get married when they graduate. Raja’s roommate and best friend Gopal (Asrani)—also poor—knows the truth of his circumstances, but Raja has fooled everyone else into believing he has a rich father (as most of them do). After he graduates he returns to his village, where he discovers that his sister Malti (Farida Jalal) and his aunt (Lalita Pawar) are being harassed by the local moneylender to repay the money lent to them for Raja’s education, or he will force Malti to marry him. Raja is overwhelmed at their sacrifices. He returns to Bombay to find work so he can send money home, and is befriended by Sulaiman (Johnny Walker), who buys bottles and boxes for recycling, and teaches Raja the trade. Raja begins earning money and sends some home to his village. He also meets Gopal again, but doesn’t contact Nisha since he is too poor to court her. When he does run into her (as of course he must), she is going into a New Year’s Eve masquerade party, and thinks that his bottle vendor outfit is his costume. She drags him in with her, where he is tormented again by Ranjit, and further realizes the gulf between himself and Nisha (he entertains with a lovely song, “Kya Hua Yaaron”). He slips out and returns home, sad and heartbroken. He takes his sack of bottles and throws it against the door; one broken bottle rolls outside where a big puff of pink smoke materializes from it. 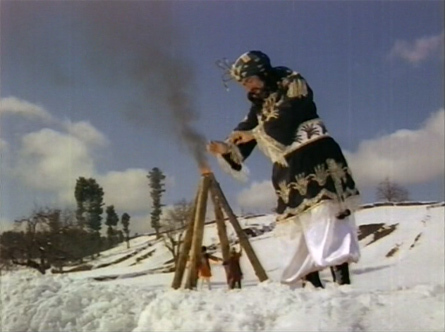 As the smoke clears a genie (Shammi Kapoor) appears. The genie was imprisoned in the bottle 20,000 years ago by an uncle fed up with his naughtiness. He has sworn an oath to serve his rescuer for a full year, and is going to fulfill this oath whether Raja likes it or not. Chaos ensues! No matter how hard he tries, the genie causes problems for poor Raja. Sulaiman tells the genie about Nisha, and he tries to help bring them together, but Nisha’s father is determined to get her married to Ranjit. Raja’s aunt sends Malti to him from the village to get her out of the moneylender’s way. He marries her off to Gopal in double-quick time (and that’s the last we see of them!). 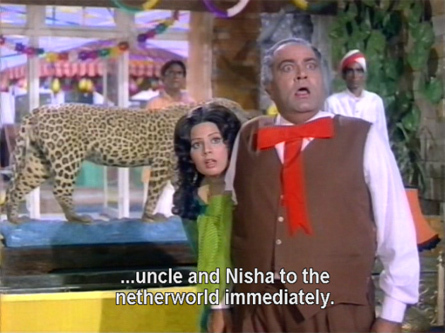 Meanwhile, Nisha and her father fight about Ranjit. Nisha wants to marry Raja no matter how poor he is. 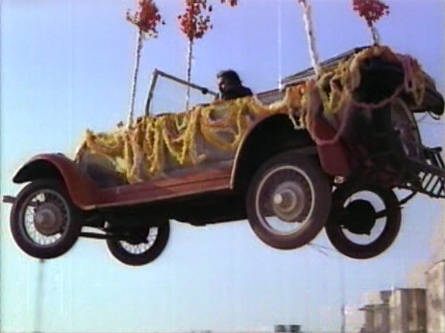 When Ranjit and some of his friends try to run down Raja (literally) he is rescued by the genie in a flying car. 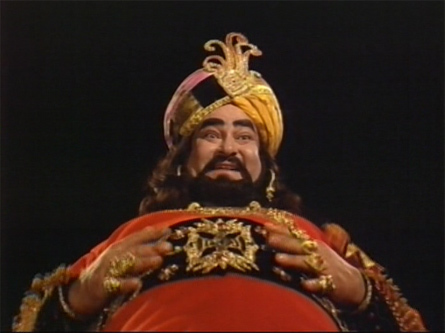 Pleased with himself, the genie gives Raja a ring to protect him from Ranjit. 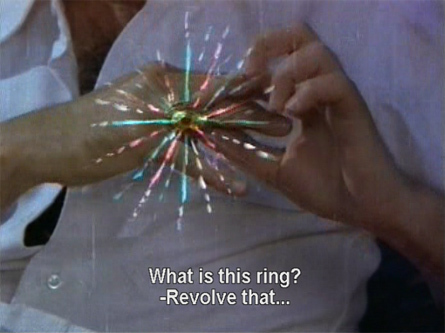 The ring, when twisted on the finger, calls up a demon from the underworld who spouts fire and chants “Zum Zum Bah!” I find him much more funny than scary. Raja can’t handle one genie, let alone two, and he throws the ring away. Ranjit, watching, retrieves it after they go. 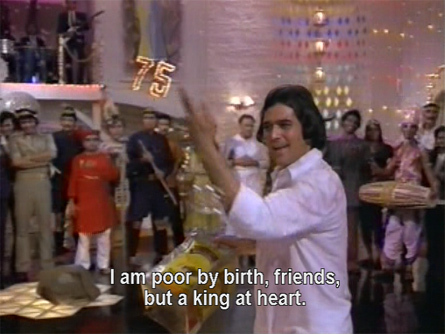 Ranjit owes money to a bunch of goondas who are after him; his plan is to marry Nisha and then repay them. He enlists the help of the demon by asking him to change him to look like Raja, and vice versa. Nisha isn’t fooled, since Ranjit hasn’t changed his voice or his manners. Raja and the genie rescue her when he assaults her. 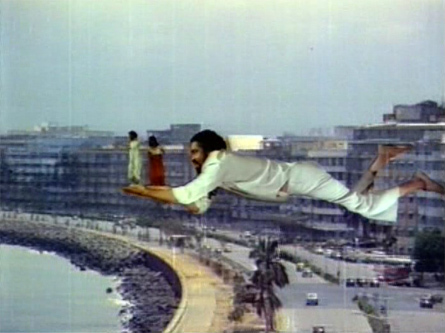 They celebrate by flying with the genie over Bombay (this time, without a car). He transports them to a magical place where they sing another pretty song. I’m reminded of Kashmir Ki Kali with a genie thrown in. By now Nisha’s father has discovered what a scoundrel Ranjit really is, and told Nisha that she can marry Raja. So Ranjit will have to resort to drastic measures! 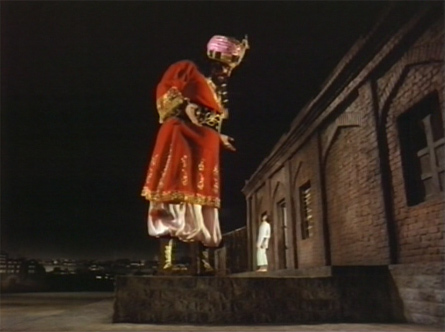 He and the demon go to Nisha’s house and kidnap her and her father, who is wearing a giant red bow. When the demon picks up Mr. Sharma by his bow, he says: “Bad manners! Bad manners! Leave my bow!” I cannot not stop laughing (and throughout the rest of the film he keeps muttering “Leave my bow!”). They are taken away to the underworld. 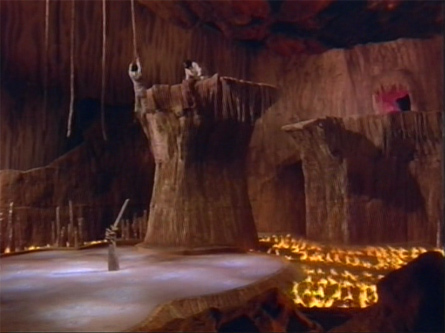 The genie and Raja follow, although the genie’s power doesn’t work in the underworld. This is what hell looks like, by the way. Can they overcome the demon without the help of special powers? Will they rescue Nisha and Sharmaji? What will happen to Ranjit? Watch Bundal Baaz to find out! And watch it for the sheer spectacle of the sets, the costumes, the special effects and the intentional humor too. The story doesn’t much matter. Posted on February 21, 2008 at 5:42 pm in Hindi movies, Yahoo! Shammi! | RSS feed You can skip to the end and leave a reply. It seems like a fun film. I haven’t covered nearly everything either. It’s very very very silly, but made me laugh really hard—and not AT the film but WITH it, if you know what I mean. I think most of the silliness was intended. 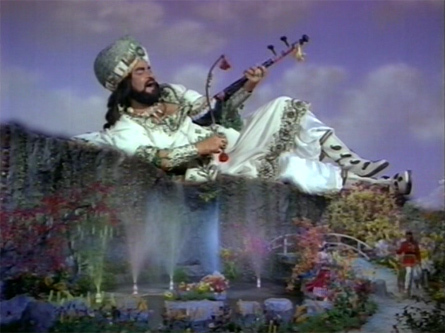 The screencap with Shammi lying on the side of the mountain with his fiddle is priceless – that is the stuff that blog banners are made of. You have no idea how many blog banners could be mined from this film. I’d seen this movie in the 70’s and I always vaguely remembered the story-line and how much I enjoyed the movie back then, somehow this is one of the movies that just disappeared into thin air. With so many channels screens millions of movies, I really hoped one would screen Bandalbaaz some day. 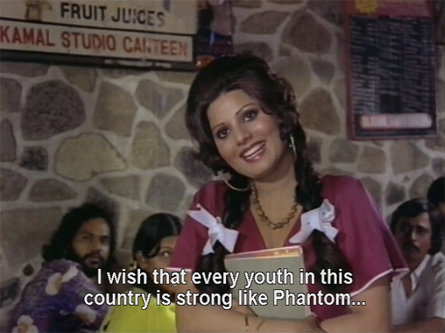 And I would always remind myself, no that movie was not a dream … Rati Agnihotri does call Kamalhassan Bandalbaaz in a song in the movie Ek Duje Ke Liye afterall. Thanks for the pics .. they’ve added scenes to my memory. The only 2 scenes I remembered until now was how the Genie transformed his jhompdi to a palace, one wall at a time upto 3 walls and seeing Ranjit and Paintal stand next to a gate as sad and sorry friends (which looked weird). I love this movie. It makes me laugh helplessly…I am sad that Shammi himself didn’t seem too enamored of it! Hi, Took the liberty of linking up the Bundal Baaz page link from my movie blog.What a refreshing place to soak in the technicolor. :)Please, please keep writing. Hello memsaab,I have loved all your posts very much.Have you seen the movie Aan-Baan ?can you please write on it. stumbled upon your blog while browsing the interwebs. memsaab u didnt put the film poster …imean the credits where the film’s name is shown. Oh why why WHY are all those films where Rajesh is silly and HAPPY such flops??? This is one of my favorites too. Pretty songs, handsome Rajesh (the hair aside), a very cute Shammi. 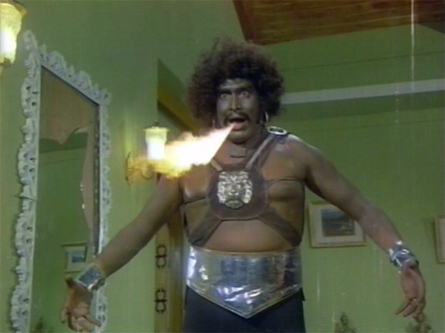 I think that the start of it with Rajesh in that phantom suit totally killed this. It would’ve been ok if it had come later in the film, but to start it with that, no. I cringed, and I am, as you termed it, a devotee! I love “I’m having a blast making this film” Rajesh and he isn’t that rare! I don’t much like ANY maudlin self-absorbed hero (or heroine), but Rajesh does not have the corner on that archetype by a looooonnng shot. Not by MILES. I find this movie kind of boring in the beginning. For me it becomes fun and A LOT of FUN at that, from the point where Shammi makes his entry as the Genie… I thought he was just so amazingly funny as the Genie. I love the humor in the movie – its wonderful. Songs are good too. It’s easy to find on DVD, otherwise I have no idea! Had to see this movie after reading your review. Boy, is it silly! Agree with @Suhan- Rajesh as phantom right at the beginning almost turned me off the movie! (I grew up on phantom comics so he has a special place in my memories) Couldn’t they think of some other super-hero? That phantom mask looked ridiculous, plus I have seen Rajesh looking good on horseback (Aan milo Sajana?) so was hard to see the disjoint horse-riding sequence! Love, just love the interaction between Shammi and Rajesh ( specially Shammi calling him ‘Mere akah’ and Rajesh calling him ‘Mere Kaka’.) Hilarious and they both look so cute, wish they had more of those scenes in the movie! Rajesh can do great comedy, his scene in Dushman with the barber when he cuts half his moustache is priceless and one of my favorites. Do not like Sulakhana Pandit, wish they had Neetu Singh instead. I was equally surprised how fast they got rid of Farida Jalal and Asrani, almost like the writer did not know what to do with them! Thank God he did not kill them out of the script. May have done so to Laita Pawar though! We will never know. Loved how Rajesh acts like Ranjit when their faces are switched, the arms, the swagger, the facial expression! Or may be I like it because I love Rajesh anyway. The end sequence with the Big Red Bow, the bollywood version of Hell (with no other sinners or Devil) and the demon had me in splits. Thank you Memsaab for these reviews. I am learning to enjoy the silly movies more and laught with them. Please keep writing! The film was scrwed up by shammi. Poor direction & he tried to hog the attention in acting also. Wonder why kaka chose to do such a film. it was an enjoyable movie n i loved it… by the way ravinder, r u related to some one from film industry as u r referring all of them as uncles…. Dear Shrikant,Read your comments,no I am no way conected to film industry,in a way yes as between 1973 and 1993as to best possible remberence I did not miss any movie(from school class third to my college days mid eightees)and all these have been my chidhood heros and even now they hold same place with me even now,and to forget that most of them are near my daddys age (1940)born though he is not alive today ,so it will be unethical and disrespectfull to refer them names,hereby I tell you that with some of them I keep personal touch via letters(sounding old fashioned)but I still do believe hand written notes are more closer to heart, I am personaly quite new this medium in fact,it just recently March 2013 I have associated with this medium. Yours Ravinder Minhas, hereby I must clear you that whensoever I comment on any movie IDO donot have to read snops,they are there in my heart,sorry but cinema is not the same as it use to be neither do touch ones heart as such my gone cinema days make them more closer to me. Regards Ravinder Minhas. okay so u r also a fan. iam also very fond of movies from 1960-1985. infact iam only a 89 born but i respect the movies of this particular era. i respect rajesh khanna immensely for the reason that he simultaneously through out his carrer did parallel cinema, art films, impactive social films and also formula based filmswhen meaningless formula movies were being made he did remakes of award winning south indian films like Anokha Rishta ( Kanamarayathu), Red Rose(Sigappu Rojakkal), Pyar Zindagi Hai (Aasai). Every year from 1966 -1991 he has films releasing and more importantly he did not follow a particular trend to stay in the market. like say amitabh from 1975-1999 kept doing same angry young man movies and we as public liked amitabh only for his movies from 1975-1984 and later so amitbah’s movies flopped miserably from 1986-1999. Dear shrikant ,you are quite young to in years,and found of cinema till 1985,Ican recomend you few movies which Ihope you will like ,ANHONEE1973,Sanjeev Kumar,Leena Chandavarkar,QUAID1975 VINOOD KHANNA,LeenaChandavarkar,GADDAR1973,Vinood Khanna Yogeeta bali,PHIR WOHI RAAT 1980 Rajesh khanna Kim,Danny.36 ghante 1973 Sunil dutt,Raaj Kumar Danny, Bulandi 1981Raaj Kumar danny,Dhuan 1981mithun,ranjeeta Rakhee.Kaun kaise1983,mithun Ranjeeta,Khoj1989,Rishi kapoor,nasser,Danny,rest latter.Ravinder minhas. i have seen all of them except for Qaid….which i was seraching for…. infact iam in a position to recommend all of u elders to watch certain movies of shahsi, randhir,rajesh khanna, etc… have seen movies of all…n thus came to conclusion that rajesh is more versatile than amitabh, dilip kumar and sanjeev as well….. infact pran, sanjeev and rajesh r the real best actors of indian hindi cienma….